Disclaimer: I am not a medical professional, and this post is not meant to be a substitute for professional care. This post is based upon personal experience. As always, do your own research and speak to a medical professional (a holistic professional, if possible!) before making any major changes to your diet or lifestyle. This is especially important if you have chronic health issues. Though it may seem that IF is a trend, it’s not. People have been fasting for centuries for cultural, religious, and health reasons. IF is not new by any means, but in recent years it’s become a hot topic of debate. This is partly due to some big guys in Silicon Valley swearing by IF to help power through long days and keep their brains in tip-top shape and from (I think) the Bulletproof culture that has brought a high fat diet into the mainstream. When practicing IF correctly, you are not hungry. Your blood sugar levels are stable, thus giving you energy. In short, this happens because when you fast you are giving your body a break from digestion (one of the most physically demanding things for your pancreas, liver, and gallbladder). There are many different ways of practicing IF, some do it for hours, days, or weeks. Everyone has a different eating schedule and amount of food they eat. Some people include ingredients (supplements, collagen, spices) while fasting that others do not. It’s all up to the faster, and we are all different. Personally, I was hesitant to try IF because of all the content I had read and the theories medical professionals had told me that skipping meals is bad for blood sugar levels and can cause unnecessary weight gain and headaches. As someone who once struggled with anorexia (10 years ago), I was a little worried IF would trigger my old habits. At my treatment center, we were told that eating food at regular mealtimes was the only way to be healthy. Once trying IF, I realized that waking up and eating breakfast when I’m not hungry just because I’ve been programmed to do so doesn’t feel right either. How is THAT healthy? IF has helped me become so much more in tune with my hunger signals and many other things that I will get into below. But first, I want to share how I fast. When traveling, out of my routine, or on days that I am hungrier, I am much more relaxed with my routine, but I try to practice a 12 hour fasting window at the very least. Before experimenting with IF, I was eating around seven times a day. To be honest, it was pretty stressful. I was constantly thinking about food because I was never satiated. I’d get anxious if I had to leave the house without a little snack to munch on. And looking back, it wasn’t good for my body either. I had a feeling of dissatisfaction in my stomach and mind, and I struggled with gas, bloat, and constipation. I was first introduced to the concept of IF when I did my first Clean Program in January 2017. 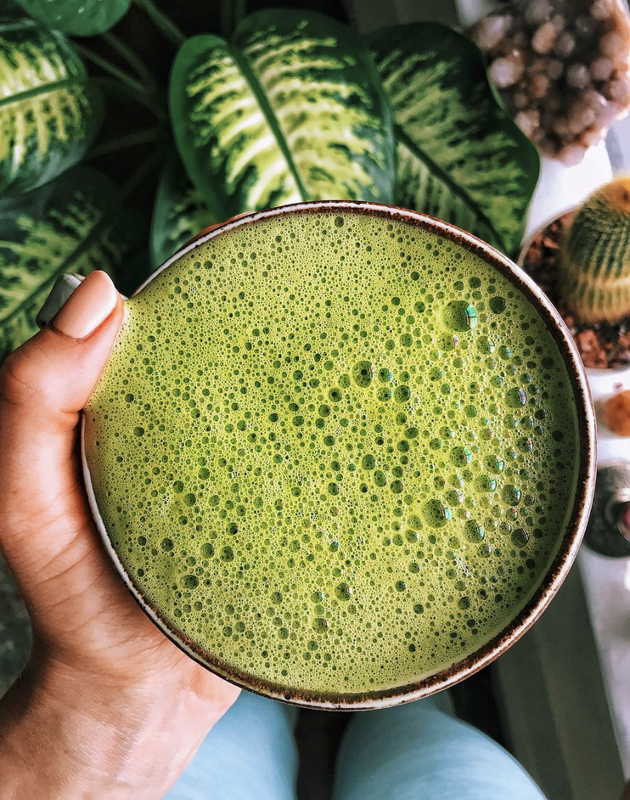 The Clean Program encourages people to follow the “12 hour window”, which means you leave a 12 hour window of consuming no food for 12 hours each night (with the exception of water and herbal teas). If you eat dinner at 7pm, you eat breakfast at 7am, or anytime after that. I was a bit scared of trying IF because I had been taught that breakfast is the most important meal of the day. In fact, the US government even has breakfast-pushing commercials to ram that into our heads. Then all of a sudden, we as a country fell so in love with the idea of breakfast being the most important meal of the day, huge iHOP sized breakfast portions and breakfast burritos the size of small dogs became normal. Personally, eating a very nourishing smoothie or some coconut yogurt with nuts and berries for breakfast makes me feel the best. Eating too many carbs first thing in the morning is a NO for my energy levels since I have PCOS. This really negatively impacts my insulin levels and makes me feel crummy. My first week of doing the 12 hour window was NOT easy. I definitely struggled with some anxiety about “not being able to eat” because I was so used to eating a bedtime snack around 9pm each night. Practicing the 12 hour window opened my eyes to the fact that I was eating a snack nightly at 9pm not because I was hungry, but because it was comforting and made me feel safe. In a way, I was using food to soothe my emotions. Once I got accustomed to the 12 hour window, I was astonished how much better my digestion was. As someone who has struggled with IBS-C for well over 10 years, going poop every day was a foreign concept to me. Constipation had caused me a lot of discomfort, hemorrhoids, bloat, digestive pain, anxiety, and depression. I continued following the 12 hour window for a year until January 2018 when I did the Clean Program again and was able to extend my fasting window to 13-16 hours a day. As someone who has struggled with IBS-C most of my life, IF has been a game changer for me when it comes to producing quicker, easier, and more dense bowel movements. To get detailed: it can be hard for me to pass sometimes, but with IF, I experience little to no issues with getting up and going within the first 30-60 minutes of waking up! Throughout the day, I’m also less bloated and sometimes I even go #2 two to three times in one day. This was NEVER the case for me before I was practicing IF. This one is interesting because many people think IF can worsen PCOS. I think it is very dependent upon your lifestyle, daily habits, and where you are on your PCOS recovery. I can only speak for myself, but IF has helped my PCOS in so many ways that I can see and feel. I think IF worked for me because I did not start IF until two years into my PCOS recovery after I had really worked to get my body, adrenals, hormones and emotions back into balance. I also made sure that I had my period for a year before I began IF. This allowed my body to be in a place where it could truly benefit from IF. I now have boosted energy levels and glowing skin, and I’ve been able to shed the excess, stubborn AF belly fat that adrenal fatigue and PCOS gave me that wouldn’t budge. For many people, IF also can reduce stress and inflammation, other PCOS symptoms. However, IF can also be an additional stress on your body, which is why I recommend getting your body and hormones back into balance by reading WomanCode and using proper diet and self care practices. More information on my journey with PCOS can be found in my PCOS Guide. Since IF-ing, I’ve noticed an increase in my overall energy level and focus. Because I am giving my body a break from digestion, I am sleeping deeper and thinking clearer. I feel so energized and happy throughout the day when I eat dinner a few hours before bedtime and then run on fats in the morning until I finally eat breakfast. IF also helps me keep my blood sugar levels stable so that I feel truly energized after eating. IF has helped me become a more intuitive eater, funny enough. I eat when I get hungry and I stop when I am full. I don’t self-soothe with food as much when I am practicing IF because I feel better emotionally, physically, and mentally. Better mood and energy levels = happier Lee. I don’t stress about what I’m eating first thing in the AM because…well, I’m not eating first thing. I’m simply not hungry, so I spend that time doing other things: meditating, journaling, getting work done, or heading to the gym. My morning hours are precious to me, and I get all my most important stuff done before breakfast. This aligns well with Tim Ferris’ book, The 4-Hour Workweek, in which he recommends doing all of your important tasks before you even check emails (speaking mostly to freelancers/biz owners, I know not all people can do that!). Those who are currently in, recovering from, or recently recovered from an eating disorder. How long after you are in a better place should you try IF? I can’t answer that for you…all I have to say is that you need to be VERY honest with yourself. If you aren't being honest with yourself, it’s all too easy to let IF transport you back into destructive habits and become a replacement for your ED. It helps to get clear with your intentions, have a solid foundation of self love, and a firm grasp on what’s best for you and your body to practice IF. You need to be able to stop fasting when your body asks you to stop, eat when your body asks you to eat, and honor your body in every single way it needs to be honored, 97% of the time. Why 97%? Well, nobody is perfect and with intuitive eating there will be days and times and weeks and months where we eat too much or eat too little or too healthy or too unhealthy. Does black tea/black coffee break the fast? Does almond milk or other nut milks break the fast? Does adding a scoop of coconut butter break the fast? Does collagen break the fast? This is debatable, some advocate for it, some advocate against it. Some say a scoop or less of collagen doesn’t break the fast, while two scoops breaks the fast. Technically, the proteins in the collagen break the fast, so if you are practicing Clean IF for a therapeutic reason, collagen is a no. I don’t Clean IF, so I have a scoop or two with my matcha. Read this forum for more opinions: https://forum.bulletproof.com/discussion/13003/what-can-i-put-into-my-coffee-while-intermittent-fasting. Listen to this episode of the Intermittent Fasting Podcast to get more detailed answers: https://ifpodcast.com/2018/03/05/episode46/. I fast for 12-16 hours, seven days a week, except for vacations. How do you know when to break the fast? What can you break the fast with? Something healthy! Just because you fasted doesn’t mean you should go out and get a cheeseburger to compensate for the time spent not eating. That would completely negate the whole point of IF. Eat a nourishing, healthy meal, as you normally would- whether it’s sweet or savory, listen to your body and what it wants to eat. Continue to make sure your meals are balanced and filling throughout the day. For me, a balance of healthy carbs, protein, fats, and tons of leafy greens is the best way to keep my body going and feelin’ good and to reap the benefits of IF. Can you take supplements while fasting? If you are trying to practice Clean IF, many theorize you should not consume any supplements during your fast. If you’re a bit laxer, supplements are totally fine. Again, it’s what is best for you and your body. IF has worked wonders for me, but it’s important to remember that it’s not for everyone and this is just based off my experience. If you are looking to begin fasting, I recommend getting really honest with yourself and your relationship to food before embarking. The best way to go about playing with IF is by testing, adjusting, and repeating. Kind of like with anything in life: you are your own best teacher and the answers are all inside of you. Do you practice IF? If so, what do you like about it? What do you not like about it?